I was a little reluctant to put this one up. It is the first one I did for the Trainwreck Union. 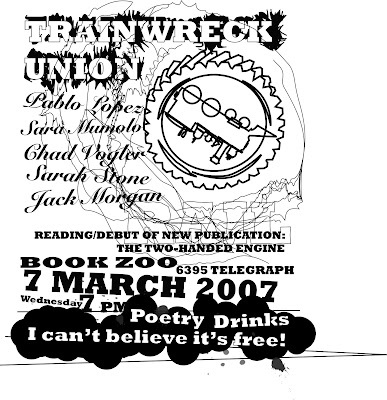 It was our first reading when we thought that anything was possible and that we were the coolest thing the poetry world had ever seen. I think that this poster really captures that energy, so I am proud of that. It was done in Illustrator. I love line art and technical drawings, so I was trying to destroy that a little along with what I thought was a Jay Ryan attitude toward text. I wanted grunge and elegance to coexist. I think I might have thought about this one more than any other, and that's not always bad. But I think I love this one most of all for nostalgic reasons. to turn up again in the most unexpected places.